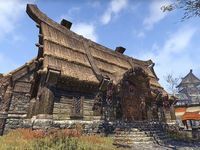 Rethan Holdings is a bank in central Riften. It is a one-room Nord-style building located in the western part of the city, near Artisan's Hall. A cooking fire can be found inside. There are several storage containers in the bank, including two trunks, a backpack, a desk, and a wardrobe. All of them, except for the desk, are owned. A Riften Guard watches the premises.